Orders over £20 must be sent signed. MUSHROOMS / FUNGI. CZECHOSLOVAKIA - set of. 4 different complete. Zdeněk Miler was born on 21 February 1921 in Kladno and died on 30 November 2011 in Nová Ves pod Pleší. the Mole flying on the rocket. Miler’s extensive artist activities also included illustrations for children’s books, such as Eduard Petiška’s “Pohádkový dědeček” (“Fairytale Grandfather”). 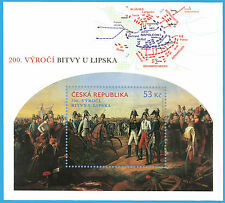 Czech 2013 stamp sheet: 200th Anniversary of the Battle of Leipzig. Catalogue number A0788. The Battle of Leipzig, fought on 16-19 October 1813 in Germany, was the largest and decisive battle of the Napoleonic wars. 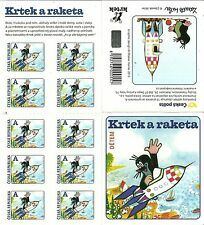 STAMPS-CZECH REPUBLIC. 1999. Joachim Barrande Miniature Sheet. SG: MS242. MNH. 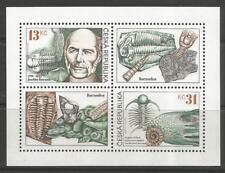 Birth Bicentenary of Joachim Barrande (French Geologist and Paleaontologist) Miniature Sheet. SG: MS242. Mint Never Hinged. The flat rate cost of this service is £9.99. Czechoslovakia 1976 Mi. 2339 Miniature sheet 100% Combating drugs. -60% quality: Lot without any fault, but in average conditions for the age. It is the 2014, Nature Protection sheet. Good condition sheet of Czech Republic. HAS BEEN FOLDED ON THE CENTRAL VERTICAL & HORIZONTAL PERFS. If no "Add to Basket" button is visible. There has been a central vertical fold and there are a number of splits along the perforations throughout. (Czech Republic 2019 Hanzelka & Zikmund Travels - Mint Never Hinged (MNH). Sheetlet with 2 values (2v M/S): 45Kc x 2. 3) Select each item and 'Add to Basket'. CHINA VALUED OVER £10. Major Faults such as Pinholes, Major Crase e s, T hins and Tears that are not noticable from the scan are always Declared. 1988 Czechoslovakia Full Sheet Of 30! Scott # 2699 - MNH OG - Although it is not visible from the scans there is a very small crease at the upper left corner - Reverse is not shown but it is clean, never hinged and with full undisturbed gum. Sport, space, etc. Miniature sheets, 9 complete sets and singles, mostly light hinged mint. emartenetecz emartenetl emartenettsheet emartenetem emartenet. is now FREE. Our Ref: Q598. We are ONLY HUMAN and can make Mistakes! Prices are SUBJECT to Change without Notice. The sheet has been folded horizontally down the middle. I see no other significant creases, tears, thins, pulled perfs or other disturbance. The reverse is not shown but it is clean. Of Saint Louis. (Czech Republic 2016 King Charles IV - Mint Never Hinged (MNH). Sheetlet with 1 value (1v M/S): 54Kc 2 labels. 3) Select each item and 'Add to Basket'. (Czech Republic 2018 Tomas Garrigue Masaryk - Mint Never Hinged (MNH). Sheetlet with 1 value (1v M/S): A. 3) Select each item and 'Add to Basket'. Czechoslovakia 1977 Mi. 2389 Miniature sheet 100% used Stamp Exhibition, Prague. Item quality -100% quality: Perfect high quality lot, without any fault. -60% quality: Lot without any fault, but in average conditions for the age. Czechoslovakia 1976 Mi. 2339 Miniature sheet 100% Fight against drugs. They travel at your own risk. -60% quality: Lot without any fault, but in average conditions for the age. CZECHOSLOVAKIA, 1988, PRAGA 88. Automobile Sheet, Used. 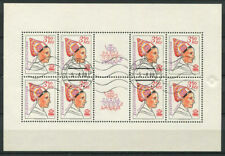 CZECHOSLOVAKIA - 1988 40th Anniversaries of "Victorious February" and National Front MS - UM / MNH. Czechoslovakia - 1988 40th Anniversaries of "Victorious February" and National Front. Scans show both front and back. CZECHOSLOVAKIA - 1986 F/USED WORLD PEACE AND LIFE CONGRESS,PRAGUE M/SHEET. A FINE USED EXAMPLE OF MINIATURE SHEET INCORPORATING 4 X 2 KORUNAS STAMPS COMPRISING SG CAT NO MS 2684. CATALOGUE VALUE £9 . Czechoslovakia 1979 Mi. 2514 Miniature sheet 100% UNESCO, Biosphere. -60% quality: Lot without any fault, but in average conditions for the age. Czech 2014 stamp sheet: Victims of World War I. The war ended with the victory of the Allies and the surrender of the defeated Central Powers. The formal ending of the war occurred with the Treaty of Versailles in 1919.